Kerry flexed their championship muscles ominously at Croke Park, steamrolling rivals Cork 1-19 to 0-9 to book their place in the All-Ireland final. The Kingdom repeated their Munster SFC final success over bitter rivals Cork to ease into the September 25 decider. Kerry will now turn their attentions to next weekend's second semi-final between Armagh and Tyrone. On this display Jack O'Connor's side will be hotly tipped with huge displays from the likes of Marc Ó Sé, Tomás Ó Sé, Eoin Brosnan and Colm Cooper. They even revealed their awesome strength in depth by introducing star players Dara Ó Cinnéide, Mike Frank Russell and Eamon Fitzmaurice as subs. The game was effectively over by half-time after an early wondershow by ace forward Cooper. The Dr Crokes hero hit four wonderful first-half points and it was no surprise that his marker, Niall Geary, was replaced after just 20 minutes. 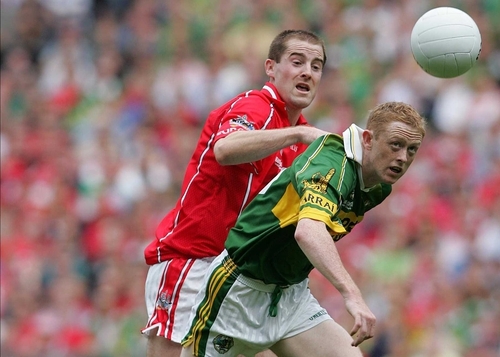 AllStar Paul Galvin and debutant Bryan Sheehan hit fine points too as Cork were simply blown away, similar to the 2002 All-Ireland semi-final. Poor Cork could only manage two points from play in that half as they hit the interval completely demoralised at 0-4 to 0-11 down. The Rebels hit points from John Hayes and Philip Clifford after the restart but Kerry's 45th minute goal from Brosnan sealed victory. Brosnan played in Cooper and when the Gooch's shot came back off the post Brosnan had a simple finish from close range. Leading 1-14 to 0-6 Kerry began to experiment and introduced those awesome subs in the run in as they eased home. Russell and O Cinneide were both on the mark after their introduction and will push hard for starting places in the final against Tyrone or Armagh. Kerry ended the game with four unanswered points, two from defenders Aidan O'Mahony and Mike McCarthy, to seal an all too easy win. The future now remains unclear for Cork boss Billy Morgan who has come to the end of his two-year term in charge. Kerry: D Murphy; M Ó Sé, M McCarthy (0-1), T O'Sullivan; T Ó Sé (0-1), S Moynihan, A O'Mahony (0-1); D Ó Sé, W Kirby (0-1); P Galvin (0-3), E Brosnan (1-2), L Hassett (0-1); C Cooper (0-5), D O'Sullivan, B Sheehan (0-2; 2f). Subs: D Ó Cinneide (0-1; 1f) for Sheehan 50, MF Russell (0-1) for Hassett 58, E Fitzmaurice for T Ó Sé 65, D Quill for Cooper 67, K Donaghy for Kirby 68. Cork: K O'Dwyer; N Geary, G Canty, G Murphy; E Sexton, A Lynch (0-1), N O'Leary; D Kavanagh, N Murphy; J Masters (0-2; 1f), C McCarthy, K McMahon (0-2); P Clifford (0-2; 1f), BJ O'Sullivan, J Hayes (0-2; 2f). Subs: K O'Connor for Geary 20, A Cronin for Masters h/t, M Cronin for O'Leary 51, K O'Sullivan for McCarthy 53.